Create your own custom frost flex color cups to wow in every detail! 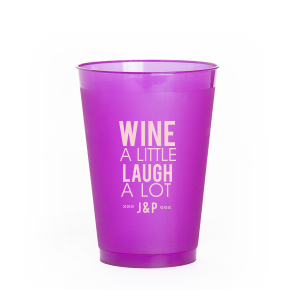 These 12 oz cups are ideal for serving mixed drinks, water or punch. 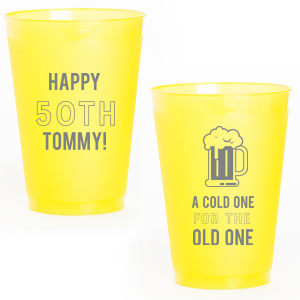 Whether planning a mitzvah, graduation or birthday party, customize with your theme colors, text and graphics for a bar element guests will adore. 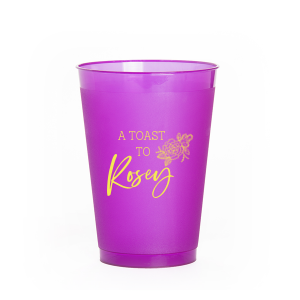 Pass your signature cocktails in colorful style with personalized 12 oz frost flex color cups from For Your Party. 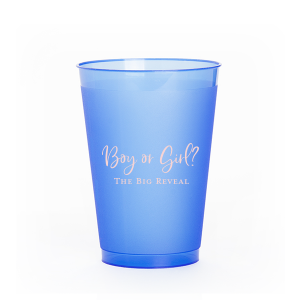 Perfect for any occasion from baby showers to wedding receptions, your custom designed 12 oz frosted plastic color cups will bring a touch of personalization to your event. Available in 5 vibrant colors, your personalized 12 oz frost flex color cups offer a fun pop of color to your party drinks! 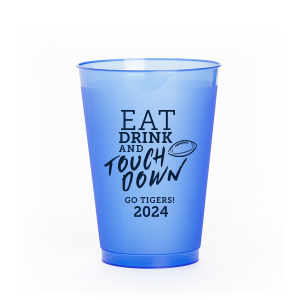 Choose from 50 screen printing color options to color coordinate your customized 12 oz frosted plastic color cups with your party theme. We have design idea galleries for a variety of event types, including graduation celebrations, retirement parties and bachelor/bachelorette parties, so you have plenty of design options for your personalized 12 oz frost flex color cups! 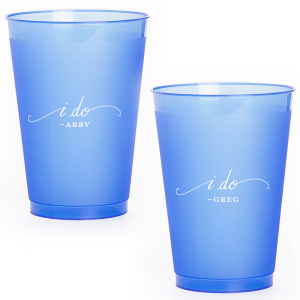 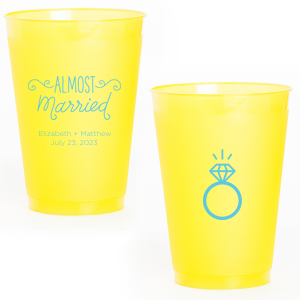 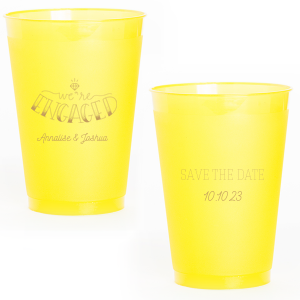 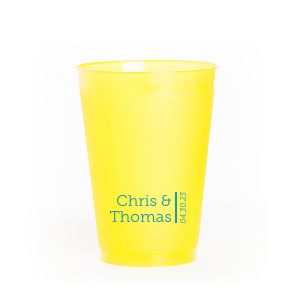 Of course, personalized 12 oz frosted color cups are a great choice for your wedding events, too! 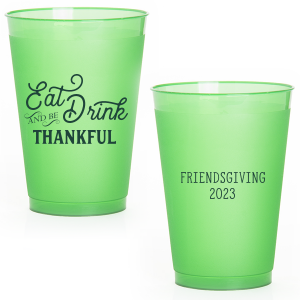 Your customized 12 oz frost flex color cups are reusable, shatterproof, dishwasher safe and BPA free, so your cups can double as party favors, too! 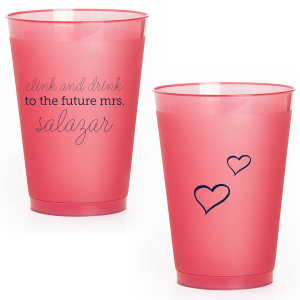 Your guests will enjoy sipping from the personalized 12 oz frost flex color cups from your party in the days to come. 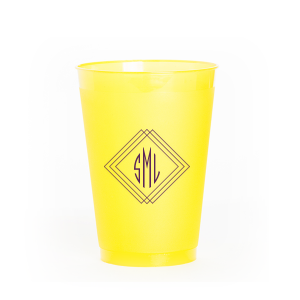 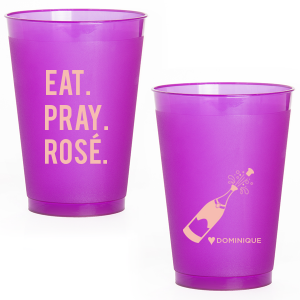 Design the perfect personalized 12 oz frosted plastic color cups for your event today!